Luke had an initial developmental study done last year at our outpatient therapy center, the Meyer Center. It's been a year, so we had another study done today to monitor progress. He's made huge gains. I can see on paper that most of the "suggestions" they made for improvement last year, he has now accomplished. And yet...these pesky age ranges. I look at this and just get tired. Twelve months of hard, hard work and endless therapy sessions for only three (THREE!!) months of developmental growth. And they, the sweet therapists, try to encourage me......that they are just a LITTLE skewed....the scores, I mean. A visually impaired kiddo is gonna have a hard time pointing at something across the room, so he was docked points for that. And his limited vision also makes utensil feeding a challenge, so he was docked for that. And he's not real interested (ok AT ALL interested) in scribbling or coloring....and again, who knows..maybe it's just because he can't see what he's writing. So, docked points again. And since he's decided he doesn't want to sleep from 2am to 5am every night, he was docked points for that. So, I get that. Not all kids fit neatly into a sweet little "standardized test". Maybe it's the rainy day. But sometimes the thought of "How are we ever going to get Luke caught up to where he needs to be?" just makes me want to go take a nap. I'm sure by tomorrow I'll be back to my "nose to the grind" self. Back to researching what else we can be doing to help Luke. Back to teaching him how to use a spoon, how to cruise along the furniture, how to say his ABCs. But doggone it, Thursdays are usually our day off. The one day we actually don't have to be anywhere for therapy. So, I'm gonna put a movie in, make a cup of coffee, listen to the rain, and just let Luke be Luke today. What a week! We are back home after a very long week in St. Louis. We got hit with the flu which turned out to be extremely bad timing since we had a week chalk full of appointments for Luke. Anyway, I'll spare you on those details. We're home, we made it, and that's what matters. Here are the updates I promised. Dr. Pediatric Neurologist: These appointments are getting more and more boring. "Still no seizures?" Nope. "So, is he doing new stuff?" Uhm, YES! "We're not on any meds, right?" Right. And don't get me wrong, boring is GOOD! Dr. Pediatric Eye Doctor: Ok, we love this guy!! We should have switched Luke's eye care to St. Louis long ago. Kickin' myself for not having done that. I just thought what we had in Springfield was good enough. And our doc here in town IS wonderful. But not great...especially considering the complicated details of Luke vision problems. So...in a nutshell. Luke does for sure have Cortical Visual Impairment, which is just another way of saying his eyes are perfectly fine, his brain is not. So, all of his vision problems are brain related. In addition, BOTH of his optic nerves are pale. Basically, it goes like this. Your eyes themselves are just an extension of your brain. 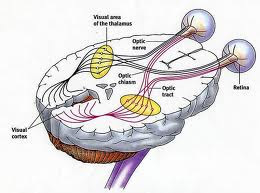 So, images are taken in and travel down the optic nerves (think cables) to the vision centers of the brain. It is here that you actually "see"...or where the brain interprets the images and tells you that you are looking at a tree or a moving car, etc. etc. NORMALLY, our optic nerves are pink, alive tissue. Luke's are pale, i.e. dead. Likely, the brain bleed took place around these nerves. Or perhaps it was the oxygen deprivation at birth. Whatever the case, tissue died and so now information is not getting through the optic nerve to the brain. Still with me? Now, when I say information is not getting to the brain, I really mean not ALL of the information. He clearly sees SOMETHING. We're just not sure what or how much. YET! The doctor ordered a Flash VEP test for Luke. This will take place March 24th. Can I just say, I am totallyexcited about this test!! Copy and paste definition from the Web. Thank you Google! A VEP (visual evoked potential) is a test that records the electrical signals of your child’s brain while he/she is watching either a flashing light or a black-and-white checkerboard television screen. A VEP shows if the brain is receiving information. By the end of the test, we should have a more precise answer about how much Luke sees. For example, he sees 30% out of his left eye and 10% out of his right eye. This will be great information for us to have!! If there is a big discrepancy between what each eye sees, than we will put glasses on Luke to keep the "bad eye" from shutting down completely. So, the disappointing news was just that optical nerve atrophy (pale optic nerves) does not improve with time. I mean what's dead is dead. We had been told before that the brain can "rewire" and children like Luke can sometimes see better over time. But, the optic nerve is THE pathway from eyes to the brain. You can't really grow a new one. Although, having said that, if there is anything Luke has shown us it's that NOTHING is impossible with God. So, to be perfectly honest with you, I wouldn't be completely surprised if one day we show up to an appointment and the doctor says, "Mmmh...this tissue is looking pink. More, uhm..normal than before." Certainly, I am praying that way!! The doctor applauded all of our therapy efforts. He said he does hear parents say, "But it seems like he is seeing better than before". (this is what we told him about Luke because compared to a year ago, he is tracking FAR better and reaching out for things and overall, "seeing better" than he did before) He explained that it's not that Luke is seeing more. He's just learning to use the vision he does have more effectively. So, that's that. Luke also has something called Nystagmus. You'll see it in some of the videos we post of him. Nystagmus is an ocular motor issue causing the eyes to move back and forth in a jittery sort of way. Also, no cure or treatment with this. But I think it can improve over time...? I'll have to do some more reading on that. The therapy sessions went great. ABM is a very interesting sort of therapy. If you were a fly on the wall during a session, you'd be thinking "It doesn't look like this therapist is doing anything at all!!" It's very gentle. Very low-key. And yet, Luke was exhausted by the end of the sessions each day. And already we're seeing better movement. Better coordination. Better balance. More confidence on Luke's part. He's not as scared to move as he was before. Pics and videos if you're interested. I always sort of giggle to myself when I hear the words "I'm a stay-at-home-mom" come out of my mouth. If you're the parent of a special needs child, than you probably know what I mean when I say that "stay-at-home" is not exactly what we do! From Day 1 we've been on the go. The first four months, it was 3 trips daily to the NICU. After that crazy ride, it was an average of 4.2 doctors appointments every week (I made that number up....but you get my drift.) Luke had more doctors appointments during his first 12 months than I've had in my entire life. Those doctors appointments (thanks be to God!) have sort of tapered off and now it's therapy, therapy, therapy. And I'll admit...I feel just a tad bit of pressure these days. There is just something about those first three years of life. I would impress with you some kind of fancy scientific statistic, but I don't have the time to go search for it at the moment. But I've read it enough times and, Lord knows, laid in bed at night hearing it replay in mind over and over again...."Those first three years are critical for a brain-injured child. We know that roughly 85% of the brain's core structure is developed by age 3." It's really been drilled into me.....do therapy now...do all you can. Don't stop. Catch it early. Despite his severe brain bleed, Luke does have a chance to develop new neurological pathways, new synapses...new neurons...his brain can "re-wire" and learn to see, to talk, to walk...to learn." And so...off we go to "therapize", if you will, and do all we can to help Luke get the interactions and stimulation that he needs to grow and develop. **Hippotherapy--chose this because of how close Luke is to walking and this therapy seems to really help kids learn to walk. I also think this is an excellent therapy for visually impaired kiddos. We'll be staring hippotherapy in the Spring, here in Springfield. We'll go once a week for 8 weeks. The Anat Baniel Method for Children (ABM) is scientifically based and the results have been validated by medical doctors. The practitioner of this method uses gentle, innovative techniques to help the brain of the special needs child form new neural connections and patterns that take the child beyond their current limitations. While it is a process, the changes begin happening right away and are often quite dramatic. This Method is a gentle, non-medical, learning-based approach. Movement and awareness are the main tools utilized for communicating with the brain, providing information the brain requires in order to form missing neural patterns. We have discovered that almost always, regardless of the specific diagnosis, the child’s brain is available for potent learning. It is through this learning process that children with diverse developmental issues can benefit from the Anat Baniel Method for Children. This method can be applied at any age; however, early intervention has generally proven to provide the quickest and most far reaching results. There are some great videos on Anat's website, anatbanielmethod.com. All of them quite lengthy, so I didn't embed, but you can check it out if you're interested. I plan to take lots of video this week during Luke's sessions, so you can wait to see those too. We will be doing ABM therapy on Wed. Thurs. and Fri. of this week. We plan to go back for week-long sessions another 2 or 3 times this year. A big thank you to First Hand Foundation for providing the funds so that Luke can participate in all of these therapies. Will keep you all posted on progress!